Both ridges involved in this great loop hike on the North side of Mt. Lemmon offer great views of one of the mountain’s overlooked gems: the Reef of Rocks. Compared with the hikes from Radio Ridge, Marshall Gulch and Sunset Trailhead, this area doesn’t get much attention or respect. However, combining Oracle Ridge Tr. #1 and Red Ridge Tr. #2 in a loop fashion affords great views, good workouts and some history of the mountain’s past mining activity. Apologies to the authors of excellent descriptions already on HAZ for parts of the trails included in this description, but I could find no description which discussed the hike as an Oracle-Red loop. There are two starting points for the hike: the Red Ridge Trailhead just down from the Ski Valley area, and the Oracle Ridge Trailhead located behind the Summerhaven Fire Station adjacent to the beginning of the Oracle Control Road. The Control Road is an alternative (but not a good one) to access the top of the mountain from the north side. The Oracle Ridge Tr. 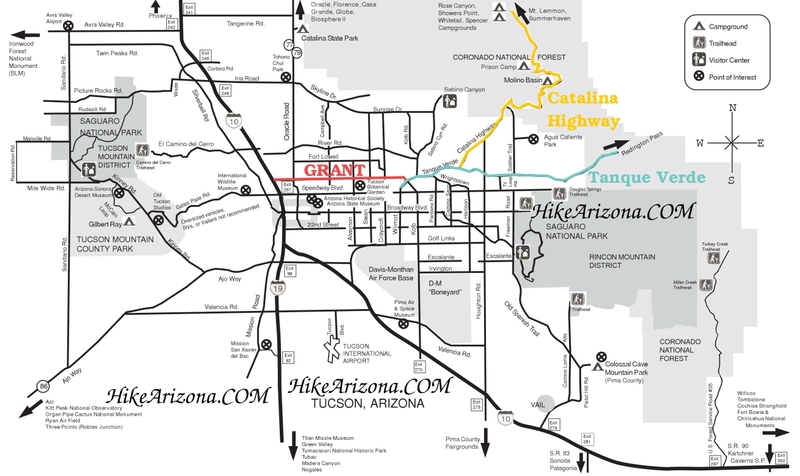 #1 is part of the 800+ mile Arizona Trail (AZT) which snakes its way across the Santa Catalinas on its way from Mexico to Utah. The section from Oracle Ridge TH north to Dan Saddle is in excellent condition since it is regularly maintained by AZT stewards. After passing Marble Peak, the trail steepens but is not difficult. It alternates between trail and road. At Dan Saddle (6880 feet ASL) turn left (west) and follow a faint but easy-to-follow mining road (Tr. #401) past Catalina Camp to the intersection with Red Ridge Trail #2. The trail along this portion is in the worst condition and is the least fun of the loop, with lots of ankle killing rocks and thorny plants (recommend long pants and gaiters). At Catalina Camp are the remains of a past mining operation, and a cabin still stands. It’s clear that the cabin gets some use, as evident from the aging grill and other camping facilities. Don’t be surprised to see someone staying here. The camp is an interesting place to say the least. About ¾ mile past the cabin, you reach a nice grove of trees and some excellent overnight camping spots. Note that the elevation of this point is about 5680 feet ASL and it will feel measurably warmer (~8 - 13 degrees F) in winter or summer than the upper THs. There is almost always some water in the nearby East Fork Creek. Be sure to cross East Fork Creek at this point and go south. The turning point is not easy to spot at first, but look around some to find it. There is a metal sign at the #401/#2 intersection just past the turning point. Do not continue on Tr. #2; it takes you further downhill NW and eventually to Canada del Oro Tr. #4. The climb up Red Ridge is relentless, but the views of the fabulous Reef of Rocks to the west get better and better. Near the top, you can see where you started over on Oracle Ridge and begin to see Summerhaven houses. Looking north, there are unobstructed views of Rice Peak, Apache Peak, and the city of Oracle. The Biosphere is visible to the NW. There is lots of shade on the lower 2/3 of the Red Ridge Trail but almost none on the upper part. If you do the hike clockwise, the entire hike up from Catalina Camp to the Oracle Ridge TH will be in the sun, although there are pockets of shake among small trees. Remember that nearly all of the elevation is on the way out, in both directions, when you are most tired. Take plenty of liquids. From Tucson, take Catalina Hwy toward the top of Mt. Lemmon. Upon reaching Summerhave, turn right toward Mt. Lemmon Ski Valley. About 1.2 km from the turnoff, look for the Red Ridge Trailhead on your right. Don't stop too soon at some signs with the words "Red Ridge" on them; those are private drives. Look for the pulloff with a sign board showing information about Red Ridge Tr. #2 and other trails in the area.